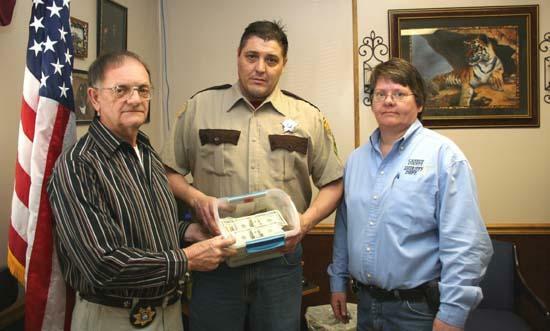 Cannon County Sheriff Billy Nichols, left, and Jail Administrator Anna Nichols, right, present Todd Overstreet with the funds raised during Saturday's benefit. On Saturday, March 6 the community turned out in tremendous support for the Chili Supper and Auction benefit for Tonya Overcast at Woodland School. Mrs. Overcast received serious burns in a home fire in January and has been released from the burn unit at Vanderbilt Hospital and is now at home recovering. She is the wife of Todd Overcast, a Transport Officer at the Cannon County Jail. Joe Young and Harold Patrick served as auctioneers and sold a variety of donated items including cakes and pies. We were extremely pleased with the turnout. We had a great crowd, fed a large number of people and everyone enjoyed the music and auction We knew that the girls basketball team was playing for a berth in the State Tournament at CCHS and a lot of people came by and ate with us on the way to the game. I was disappointed that they lost their game but I want to congratulate the Lions and Lionettes on a great season. Jail Administrator Anna Nichols, who coordinated the event, said proceeds from the supper and auction totaled $8,105.00. We also had a little over $1,900 from individuals, churches and organizations including a check for $300.00 from the local chapter of the FOP (Fraternal Order of Police) for a total of over $10,000. I would like to thank some of the major sponsors of the supper. They included: Woodland School Principal Kim Parsley, Cannon County Board of Education and Director of Schools Barbara Parker, Steve Smith, Piggly Wiggly, Robert Orr Sysco, Bunny Bread and Cannon Market. Lastly I want to thank my employees. They are a dedicated staff and I appreciate all their help. The supper was a huge success and is all because of their hard work. Also contributing a big part in the success of the Chili Supper and Auction was Angela King and the staff at the REACH Program and to anyone else who helped in any way - we say THANK YOU!